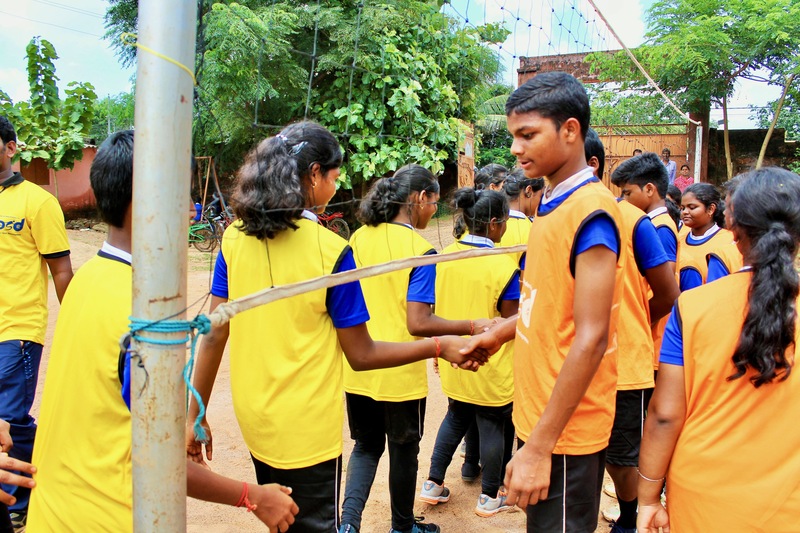 Pro Sport Development (PSD)’s mixed gender competitions in Bhubaneswar have been expanded to include volleyball, a sport which has rarely seen different genders competing together in India. In a unique sporting spectacle, Pro Sport Development (PSD) organised a Mixed Gender Volleyball Tournament in Bhubaneswar on 23 September 2018, as part of the Community Sports Program supported by Tata Trusts. 158 children (49% girls) from seven slum-based schools of Bhubaneswar, all part of PSD’s Community Sports Program, participated in the event, which was held at Vivekananda Shiksha Kendra school based in Dum Duma slum. Sixteen mixed-gender teams of 9 - 10 members per team took part in the tournament. Of the six playing members, the gender proportion on court had to be equal at all times i.e. three girls and three boys. The tournament began with the group matches, with four teams in each group. Each team got an opportunity to play at least three matches. The top two teams from each group progressed to the knockout stage. The knockout stage of the tournament started with the quarter-finals, progressed into the semi-finals and eventually concluded with the final match. It was a unique learning experience for all teams, however those that gelled well together (especially among genders) and incorporated the values of teamwork and communication in their play, performed the best in the tournament. The final was played between one of the teams from Beena Bharati Vidya Mandira and one of the teams from Government Ashram School. In an enthralling final, the team from Beena Bharati Vidya Mandira emerged as champions.